Calendar: In the Balinese Hindu calendar, the year is 210 days long. Therefore, religious holidays occur at 210-day intervals. Only the province of Aceh on Sumatra follows the weekly Islamic schedule with workers having Friday and Saturday off. Standard practice in the rest of Indonesia is to have 11:30 AM to 1:30 PM Friday and all day Saturday and Sunday off. Religion and Social Customs: In general, Indonesians practice religious tolerance and accept intermarriage between of those of different faiths. Interestingly, in Bali, marriage to someone of a different Hindu caste is discouraged. Islamic men in Indonesia may have as many as four wives, but plural marriage is prohibited to government employees. In the seventies, the government introduced family planning. According to our guides, that campaign (dubbed “two is enough”) has been most successful on Bali where the predominantly Hindu population doesn’t practice plural marriage. Language: Indonesian is the official language of the country and most, if not all, books are printed in that tongue. However, as might be expected in such a diverse land, many other languages are spoken. Jun reported that in Bali, speakers use various levels of Balinese, depending on the castes of those involved in the conversation. Transportation: The ground in Jakarta is too watery to allow subway construction, but plans exist to build a monorail and convert some existing traffic lanes to rail lines. Some commuters spend as much as two hours each way in traveling to and from work. Both cars and mopeds are required to have at least three passengers in order to use HOV lanes. A license is required to drive a moped. However, enforcement of regulations is lax. No proof of age is demanded. Jun told us that when he went to apply for his license, the examiner gave him a copy of the answers to the written test and told him to write them down. Upon turning his answers in, he was told it was too hot for a road test so the examiner gave him a license and sent him on his way. One of the travelers noticed we weren’t seeing strollers in Indonesia as we do in the States. Our guess as to the reason? Hauling a stroller on a moped while juggling an infant and negotiating city traffic would be a stretch. Gas prices are comparable to those in the U.S. In the countryside, people often use railroad tracks as pedestrian paths. From the bus, we saw a set of tracks spanning a high ravine. Jun pointed out that at intervals over the span there were small platforms jutting out from the track. Pedestrians step onto those to avoid getting struck if a train comes along while they’re crossing the chasm. Food Trivia: In Jakarta, we snacked on avocado ice cream. Avocado ice cream! Delicious! Who knew? In small villages, we visited cottage industries in which families supported themselves by making and selling tofu. Many of the soybeans they used were imported from the U.S. as they are considered superior to those grown locally. The freshest coconut I’ve ever had? In a village in Indonesia, where an accommodating host shimmied up a palm tree, whacked off a coconut and led us to his house where he opened it, let us sample the milk, then served chunks of the tasty fruit. A group of local teen-agers visit ancient Sambisari Temple. 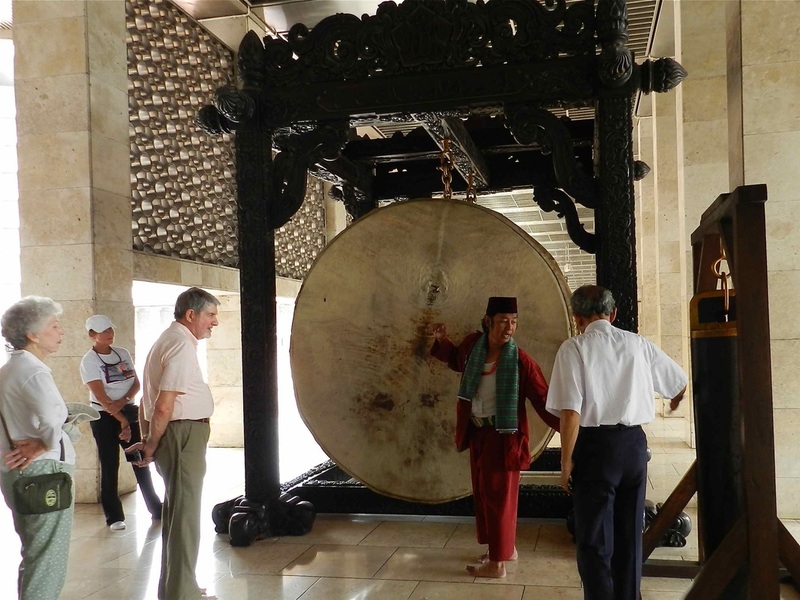 Hendy explains the use of the huge drum in Istiqlal Mosque in Jakarta. 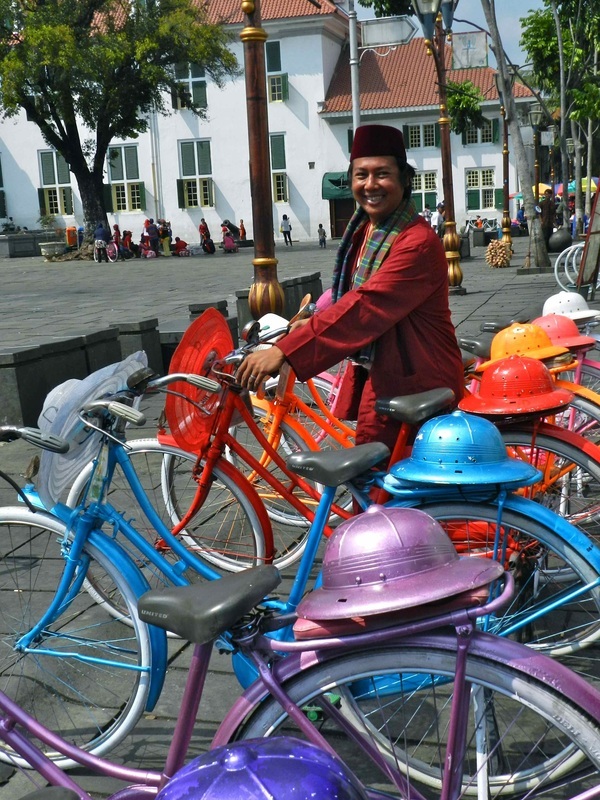 Hendy threatens to leave us on a colorful rental bike in a Jakarta plaza. 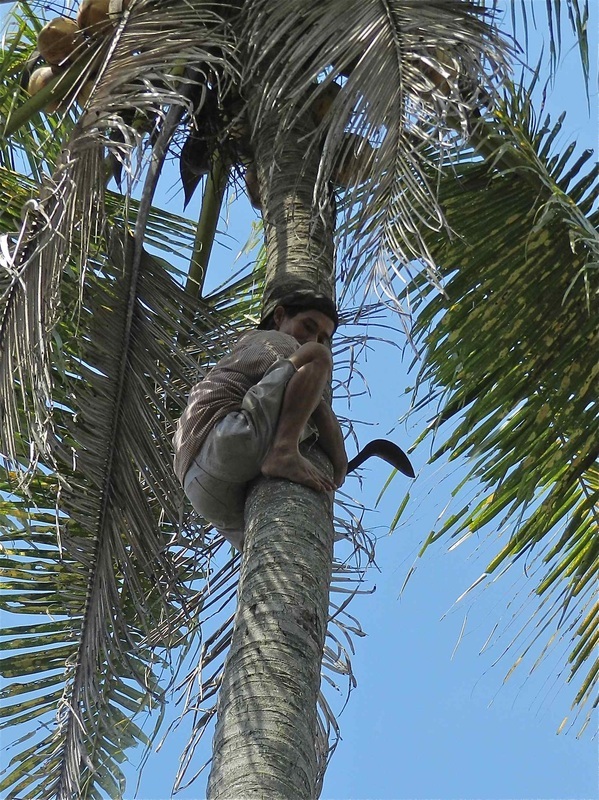 A nimble Javan scrambles up a palm tree to harvest a coconut to share with our group.